TRY IT OUT FIRST WITH DISCOVER SCUBA! The PADI Discover Scuba experience is a fun and exciting way to try scuba diving and to see what it is like to breathe underwater. No prior scuba diving experience is necessary, but you do need to be in good physical health. This is not a certification course. READY TO GET CERTIFIED? TAKE AN OPEN WATER DIVER COURSE! This is the entry-level beginning scuba diver course. PADI Open Water Diver certification is issued upon successful completion of this course. 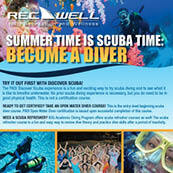 NEED A SCUBA REFRESHER? 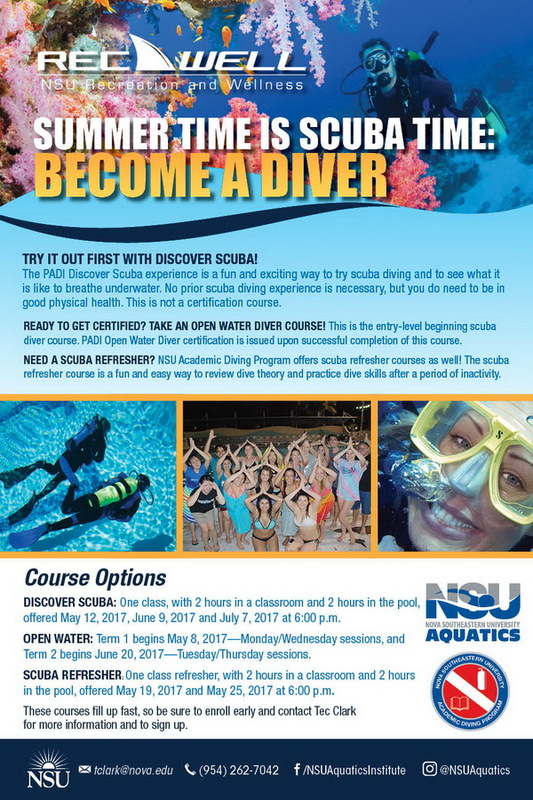 NSU Academic Diving Program offers scuba refresher courses as well! The scuba refresher course is a fun and easy way to review dive theory and practice dive skills after a period of inactivity. DISCOVER SCUBA: One class, with 2 hours in a classroom and 2 hours in the pool, offered May 12, 2017, June 9, 2017 and July 7, 2017 at 6:00 p.m.
OPEN WATER: Term 1 begins May 8, 2017—Monday/Wednesday sessions, and Term 2 begins June 20, 2017—Tuesday/Thursday sessions. SCUBA REFRESHER: One class refresher, with 2 hours in a classroom and 2 hours in the pool, offered May 19, 2017 and May 25, 2017 at 6:00 p.m. These courses fill up fast, so be sure to enroll early and contact Tec Clark for more information and to sign up.